Thai Food Cooking and Eating | Where is Best for What? Food for most Thai people, is simply a way to survive! For others, it is a way to make money as a business. Eating in Thailand for tourists, is a journey into the unknown. As such, it presents you with surprises, normally good - rarely bad! A typical traditional Thai meal will most certainly consist of soup, salad, fish, rice, vegetables and maybe some meat. The meat is usually pork or chicken - sometimes beef. 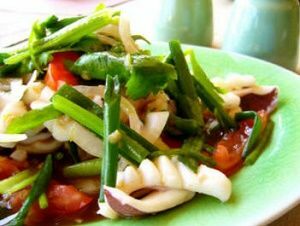 Thai food and cooking embraces the best of Chinese and Indian traditions - blended and modified over the years into what is now regarded as a specific cuisine - that of 'Thai Food', and increasingly being tried in western countries, Thai cooking. Noodles are also a major part of the cooking scene, with several different types to choose from, depending upon which area of Thailand you are. Your meal will almost certainly be accompanied by small condiment bowls of individual spices, chillies and other 'embellishments'. Make it as hot as you like. The great thing I have found about Thai Food, is that much of it is served in a way that makes it acceptable to most around the table. Once served, then you can add as you wish. The company that I keep - two delightful Thai girls - are at opposite ends of the 'heat' scale insofar as the winding up of dishes to maximum 'spiciness' are concerned. At every meal we have shared so far, they are both able to adjust the food to their own particular tastes. One preferring it so hot that her whole visible appearance takes on a glow, and the eyes are a great barometer of 'spice level'. I have tried a few titbits from her plate (it is allowed, even encouraged) and have bravely kept good face whilst pretending that the drink of water is just incidental. It feels as though it instantly turns to steam upon contact with said morsel. The other girl is quite content to adopt a slightly cooler spice regime. In fact, any red or green chillies found in dishes are courteously offered around! I have a slight air of smug satisfaction at being able to cope with the same spice level - even slightly more. All Thai Food that I have eaten, whether at the roadside, fish food restaurant, or home cooked, has been first rate. The most basic 'noodles in a bag' from the roadside stall holding its own against that served up in a slightly more expensive restaurant. Always enough to sort out any hunger pang, and at a cost of somewhere between 10 - 60 baht! I am getting used to prices now, and don't automatically go for the currency converter on my mobile. For those wishing to know, we are talking of maybe barbecued skewered meat morsels, with salad and spiced to taste - all in a good grade plastic bag - for around £0.17 to £0.60 a meal. The higher priced meal in a bag is right at the top end. Further up the scale - in terms of choice, comfort, and price, are the many restaurants to be found in every shopping mall or street corner it seems. Here in Bangkok, I have been gob smacked at the number of places that one can eat throughout the day and well into the following day as well. Restaurants are as varied as the dishes they serve, with several good Seafood Restaurants - my favourites - and all manner of tastes including Japanese, Italian, and yes - even the branded fast food chains such as Mac, B-King, and KFC. I almost feel a traitor to the Thais mentioning them. The restaurants are wherever you want to be, on land, by river, hotel, shopping, markets, dinner cruises, etc. I cannot vouch for the invidious Fast food outlets here in Bangkok, nor do I ever intend to be able to do so. Thai Food and Thai Cooking is in a class of its own. Why bother with anything else?